Vegan Egyptian Koshari got even better and healthier. 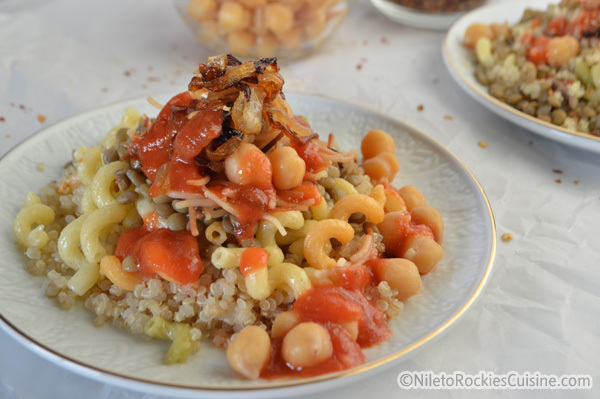 Nutty quinoa face to face with lentils, chickpeas, quinoa pasta, caramelized onions and more, swimming in a poodle of garlic tomato and cumin sauce… OMG do I need to say more?!!. 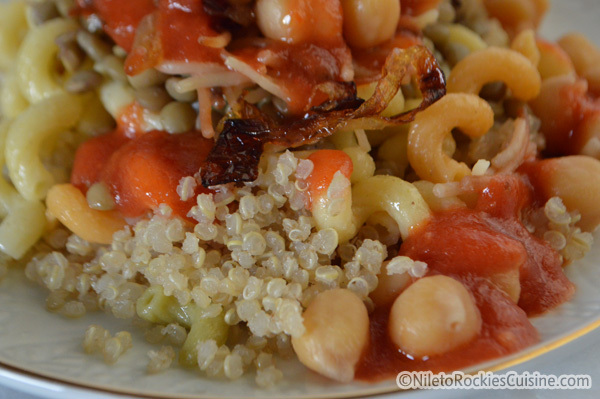 One of the best – if not the best ever – quinoa meal recipes you’ll have. 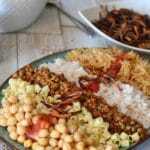 Check out the classic Koshari recipe here. Hello friends.. do you like my new look? We’re still working on finalizing everything here so it will keep changing every now and then until it settles down, but I promise you we’ll do our best of the best. I would like to hear your opinion about the new look and you are welcome to leave your suggestions in the comments below or email me at [email protected], I hope the name is not too long for you. The web is flooding these days with delicious pictures of quinoa and zucchini noodles, I’ve never been a fan of substituting ingredients to healthify a recipe, but we come eventually to the reality that we should take more care of our aging bodies. So I’ve started with quinoa. I’ve tried it in a restaurant in a soup recipe that had a baked chips on the side, so when I finished my plate I turned to my hubby next to me and said ” The best thing in this recipe is the …. you guessed it … the bag of chips . I mean, seriously, it was an awful and unpleasant first impression of quinoa. After almost two months I’ve decided to try it again, but this time cooking it my way, not in a salad, not in a soup but in a real filling and hearty meal. I’m a big fan of two things, rice, pasta and desserts of all kinds, actually just realized that they are three. When winter hits, it is always time to look for comfort food, and what is comfort food without carbs?. I’ve tried brown rice, farro and freekeh before, they are ok but not that big OK for me to have them everyday. What I really like about this  recipe is that even if you are a quinoa hater like I used to be, you will fall in love .. not with the quinoa but with the recipe and you will not even realize that quinoa is in there because it gets totally mixed up with the rest of the flavors and eventually, you’ll be eating something that is totally delicious and healthy, two words that I cannot usually find in one recipe. This delicious quinoa meal is one of the best quinoa recipes you’ll have, I bet you’ll love everything the flavors, the texture and the feeling of eating something healthy. I’ve used quinoa pasta to complete the meal but if you cannot find it, then just use regular pasta or better yet whole wheat pasta. 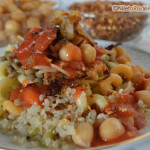 This recipe is a twist to the traditional Egyptian Koshary I’ve made before, this time I’ve also caramelized onion rings in olive oil instead of frying. You may use dried hummus – chickpeas- or use the canned ones instead, I’ve used the canned to speed up the process, also using vermicelli is totally optional, but really after trying this recipe I will be totally fine without it. Deeeeeelicious !!!! I just looove to literally make my koshary swim in sauces ( tomato and cumin garlicky vinegary sauces) and sprinkle with a generous pinch of red chilli flakes to spice things up and feel the heat in this cold winter nights. This is one of the best quinoa recipe you'll have.. away from salad and soups .. this is a real meal by itself. 1 Package of quinoa pasta - or use whole wheat if you cannot fine one. 1 1/2 c dry brown lentils. 2 large onions thinly sliced. 1 1/2 tsp minced garlic. 1/4 c of white vinegar. 1 tbsp of heaped cumin powder. Start caramelizing the onions as it will take a long time. In a large pot add 3 Tbs olive oil and then add the onions, caramelize over low heat, until brown and sticky, will probably take an hour so keep an eye on it and stir occasionally. Rinse lentils very well then cover with water and a pinch of salt in a pot over high heat, bring to a boil then reduce to medium and let it cook completely. Rinse the quinoa well, drain. In a sauce pan heat 2 Tbs olive oil and toast quinoa for about 1 minutes then add 2c of water and salt. Bring to a boil, then reduce heat, cover and cook for about 15 minutes. Let it stand for 5 minutes covered then fluff with a fork. In a pan over medium heat, add 2 Tbs olive oil, saute the garlic then add vinegar, stir in the tomato sauce, season and let it cook for 10 minutes. In another pan heat the oil then saute garlic, add cumin and stir for 30 seconds. Add the vinegar, water and season and cook for 10 minutes. Cook the vermicelli, by toasting in a large pot then add water and a pinch of salt, reduce heat and let it cook until tender. 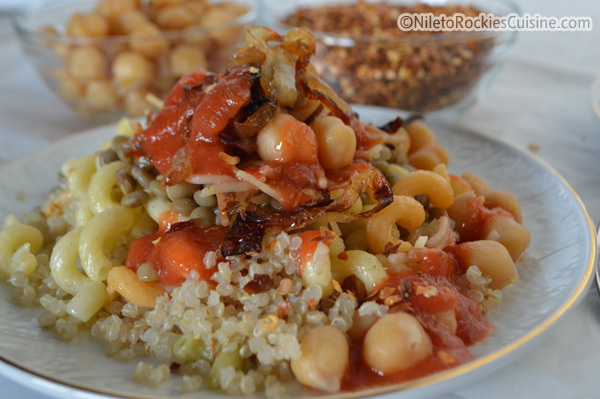 Assemble the plate by adding lentils then quinoa at the bottom, top with some pasta, vermicelli and finally the caramelized onion and some chickpeas. Drizzle with one or both of the sauce, and sprinkle with some red chili crushed pepper. 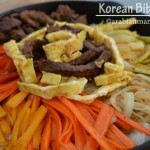 Youmen, I’m so happy that you’ve liked this recipe. Thank you for your feedback I appreciate it. You’ve made my day :). I really only ever had Quinoa in salad and like you I’m not wasn’t a big fan. I’ve heard of combining it with other grains and your koshary looks so appealing. I’ll have to try the original first *wink* purely for the comparison. 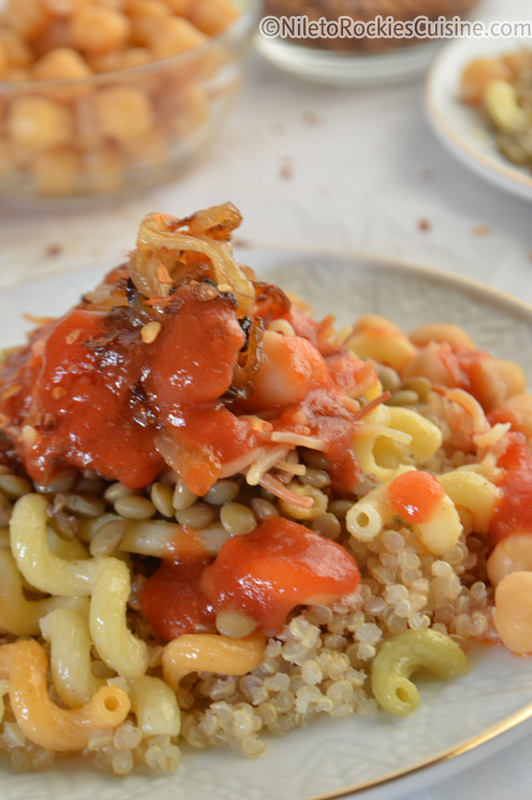 Woow I cannot believe that you did not try the koshary recipe up until now… it is super delicious .. everyone tasted it fell in love, I even had a friend who won a cooking contest with this dish :). Jazakom Allah Khairan for your sweet comment. Love the caramelized onion topping it elevated the whole dish. 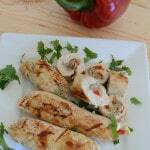 Waaaay better than the deep fried one- in the traditional recipe – and I bet healthier too. Thanks Norma. 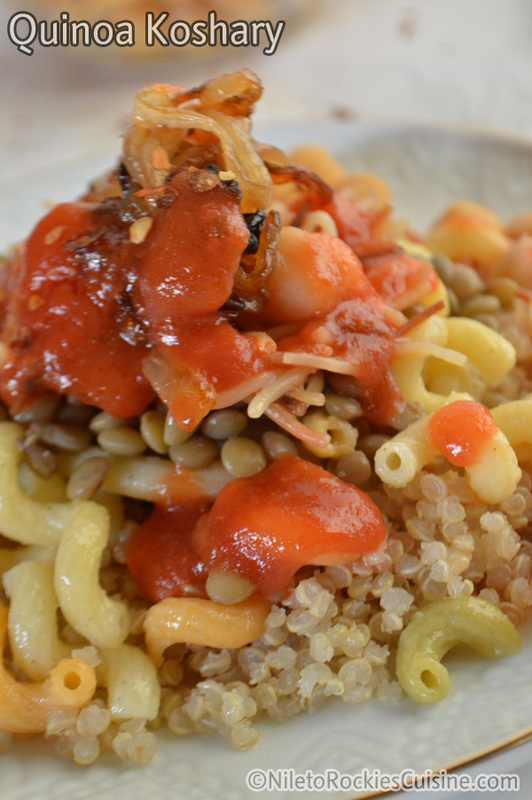 Quinoa is a great vehicle for delicious sauces and dressings—and it looks like you hit the mark here! It is indeed Liz, I did not have a good first impression for quinoa due to bad introduction hahaha but now I am a fan. Your dish looks great! It reminds me something my Polish grandmother used to make with green peppers and diced tomatoes. Can’t wait to try your recipe! Thanks Pamela.. nothing is better than food with sweet memories. I’ll wait for you to come and tell me how it went.